Many different aspects of Justice Scalia's legacy on the Supreme Court have been discussed extensively since his death, but one important issue has largely escaped attention: his outsized role in promoting the use of forced arbitration in consumer, employment and a wide range of other types of contracts. Fine print forced arbitration clauses bar consumers and workers from going to court, but require them to go into a corporate-designed private dispute resolution system where they are forbidden to be a part of a class action. As the New York Times set forth in a series of remarkably thorough and well-researched stories, forced arbitration has allowed corporations to break the law and get away with it in a wide variety of settings. Justice Scalia played a central role in bringing about this state of affairs. He was not only a reliable vote for enforcing arbitration clauses and expanding the 1925 Federal Arbitration Act far beyond the intentions of its framers, but he also wrote the most controversial and significant of the Court's decisions enforcing forced arbitration clauses. In American Express v. Italian Colors, for example, in 2013 Justice Scalia wrote the majority opinion in a sharply divided 5-4 decision holding that a take-it-or-leave-it arbitration clause could be used to prevent small businesses from actually pursuing their claims for abuse of monopoly power under the antitrust laws.This built upon Justice Scalia's 2011 opinion for the Court in AT&T Mobility v. Concepcion, which overturned (without mentioning) more than 100 decisions where appellate courts in 20 states and the majority of circuits, and district courts throughout the country, had previously held that where a provision banning class actions in an arbitration clause was proven to prevent individuals from vindicating their rights under consumer protection or civil rights laws, that the clause couldn't be enforced. In Concepcion, Justice Scalia invented a new rule of federal law that wiped away basic state contract law rules against contracts that let corporations just opt out of basic laws. So what does this mean for what will happen to forced arbitration now that Justice Scalia is no longer on the Court? Well, obviously everything hinges upon who ultimately succeeds him. But if the next Justice is one who refuses to put corporations' rights to force people into arbitration ahead of all other federal and state laws, there is reason to believe that the Court may reverse decisions such as Italian Colors and Concepcion. I was reminded of Lochner reading some decisions of the Court concerning workers, consumers, credit card holders who signed agreements saying "if you have a dispute with us, you can bring it only in arbitration -- not in court -- and you cannot use the class action. You must sue for your individual claim, which might be 30 dollars, and that's it." And that has also been described as tied to liberty of contract. It is hard to read these words without understanding that Justice Ginsburg is indicating that Concepcion and Italian Colors are not just wrong, they are disastrously wrong, usurping the power of legislators to protect workers and consumers. 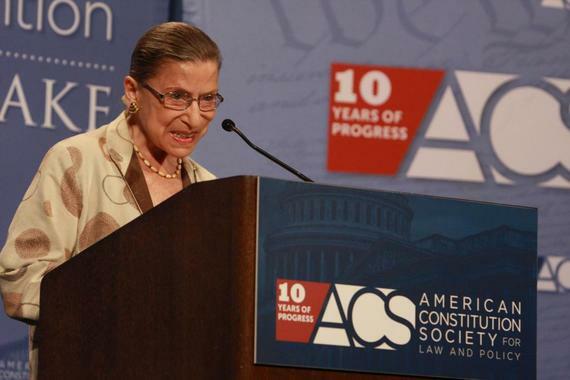 Similarly, in a dissent in a very recent decision (DirecTV v. Imburgia), Justice Ginsburg noted that the Court's "decisions have predictably resulted in the deprivation of consumers' rights to seek redress for losses, and, turning the coin, they have insulated powerful economic interests from liability for violations of consumer-protection laws." That's telling it like it is! Justice Ginsburg is hardly the only justice to question the legitimacy of Justice Scalia's most aggressive opinions promoting forced arbitration. In the Italian Colors case, Justice Kagan wrote an eloquent, even fierce dissent, that described the majority opinion as a "betrayal" of both the Court's own prior arbitration decisions (the Court always used to say that arbitration just meant shifting a case from one forum (court) to another (arbitration), but was not supposed to mean that people lost their underlying substantive rights) and of the antitrust laws. With Justice Scalia gone from the Court, no one can say what will happen next, with respect to forced arbitration or any other issue. But the exceptionally strong words of Justices Ginsburg and Kagan raise a very real possibility that the Supreme Court's love affair -- with forcing Americans into arbitration even when it lets corporations break the law with impunity -- may finally be over.